As the capital city of Zhejiang province, Hangzhou is located in southeast China and about one hour drive (150 kilometers) from Shanghai. 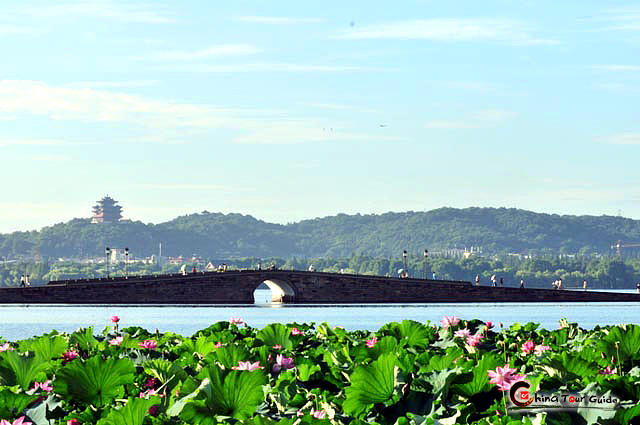 Contrasting to the hustle and bustle of Shanghai, Hangzhou is well-known for its extraordinary beauty and elegance. A popular Chinese saying boasts: "above there is heaven, on earth there is Hangzhou and Suzhou." The serene loveliness of Hangzhou's West Lake (Xi Hu) and the surrounding hills remain spell binding. Millions of tourists visit here each year to admire the graceful willows, tranquil waters and expansive gardens. 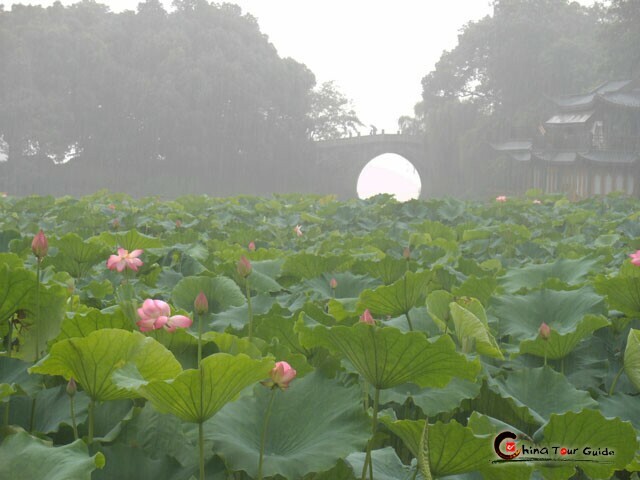 Besides the West Lake, Hangzhou is teeming with eye-catching sights. From places of major cultural and historic significance, like the Grand Canal and Six Harmonies Pagoda, to sites of striking natural beauty, such as the Qiantang River and Lingyin Temple, this is a destination sure to please anyone with an eye for aesthetics. Modern facilities and amenities contribute to making Hangzhou one of China's most popular visitor destinations. Hangzhou has been known for centuries of wealth and high culture, profiting from the region's famous silks and teas. 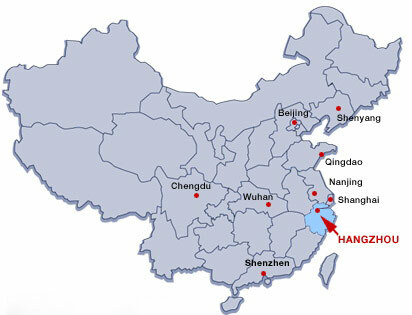 Hangzhou grew in political importance during the Southern Song Dynasty (1127-1279 AD) after invaders from present-day Mongolia ransacked the Song capital Kaifeng in Henan province. Emperor Gaozong (1107-1187 AD) fled to Hangzhou, where he set up his new capital. The imperial court's patronage boosted Hangzhou's importance as a commercial hub and brought China's best scholars, artists and poets to the city. The healthy silk and tea trade expanded during the Ming Dynasty (1368-1644 AD). The 1,000 km Grand Canal linked the city to distant Beijing and to ocean trade routes to Japan, Korea, Southeast Asia and the Middle East. The city's population grew in number and wealth. Merchants and officials led lives of leisure, building extravagant homes and pleasure boats for West Lake. The city's fame brought curious visitors throughout the Qing Dynasty (1644-1911), and Emperors Kangxi (1662-1722) and Qianlong (1711-1799) held court in Hangzhou, the latter building a palace on Solitary Island (Gu Shan) and an imperial library. Hangzhou is served by the Xiaoshan International Airport, which is located some 27 kilometers from downtown Hangzhou. There are daily flights to major cities and bigger tourist cities in China. The airport also offers flights to and from Hongkong and Singapore. Airport shuttle buses are available to pick up passengers from the city center to the airport for RMB20. Travelers can also take a taxi there for around RMB100. Hangzhou is the hub for transportation in Zhejiang Province. The city has four long distance bus stations, East, West, South and North bus stations. Buses to the neighboring areas including Nanjing and Shanghai are plentiful. There are two railway stations in Hangzhou: Hangzhou New Railway Station and the East Railway Station. Both stations land passengers for a short bus or taxi ride to the city center. Daily services from Hangzhou to China's major cities including Wenzhou, Ningbo, Shanghai, Beijing and Guangzhou are conveniently available. 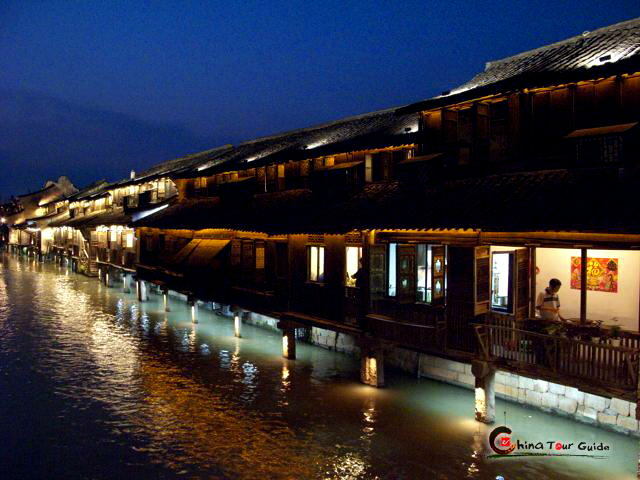 Boat trips from Hangzhou to Suzhou or Wuxi along the Grand Canal is available. Boats often depart at the night and reach the destination in early morning. This service is usually only available in summer or peak seasons. Travelers should check first when planning this trip. As a tourism city, Hangzhou has a good public transportation. Public buses go virtually everywhere in the city proper. The bus number is important. Buses numbers prefixed by "K" are air-conditioned. Buses numbers prefixed by "3" and "5" are running to the neighboring rural areas and special lines, respectively. 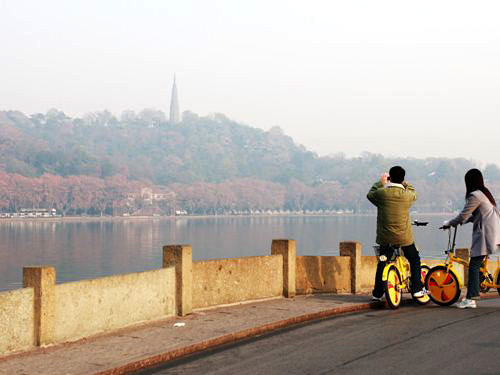 Bicycles are a great way to travel around Hangzhou, especially the West Lake. More than 30 bicycle-rental agencies are located around the West Lake, which provides a great location to begin a bicycle trip. Bicycle rent is also available at the entrance of Zhongshan Park in Solitary Hill.